Absolute Journey Tribute is the most traveled Journey Tribute band in the world, entertaining thousands between the USA and Asia! Royal Caribbean International has an interesting promotion for you: 30% off on every guest for these two itineraries. It's a great opportunity to enjoy the sun, good food... and Absolute Journey Tribute, of course. Book now! 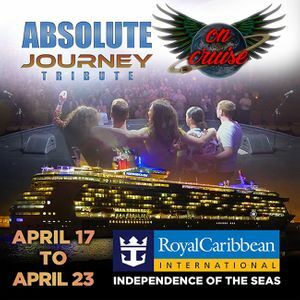 Absolute Journey Tribute will be a featured entertainer on two Royal Caribbean International cruises: April 15 to 20, 2019, visiting Mexico and Bahamas and April 20 to 25, 2019, visiting Haiti and Jamaica. Absolute Journey will be on ship between April 17 and 23. Check out royalcaribbean.com for more info.